‘Crystal Ball’ is the newest ornamental introduction of native origin from Aquascapes Unlimited, Inc. – a native wetland plant nursery located in Pipersville, PA. Other Aquascapes Unlimited introductions of native origin include ‘Silk Stockings’ (patent # PP12198) a red leafed Arrowhead with net-like patterns, and ‘Big Red’ a super vigorous Golden Club with red petioles. Aquascapes Unlimited grows wetland, aquatic, and carnivorous plants from seed. ‘Crystal Ball’ was discovered as a sport, isolated, developed, trialed, and propagated for 3 years in the nursery. ‘Crystal Ball’ was 1st introduced (in honor of Greg Speichert, who founded Crystal Palace Perennials – a nursery dedicated to developing and introducing new plant varieties to the wholesale trade) at the Perennial Plant Symposium (PPA) on July 6th, 2012. 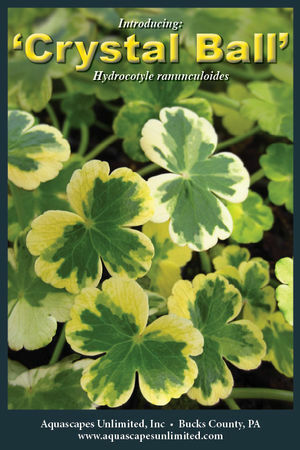 Greg & Sue Speichert literally wrote the book on aquatic plants: The Encyclopedia of Water Garden Plants. Greg was an outstanding plantsman who unfortunately passed away suddenly while attending a plants conference at Longwood Gardens in PA. In keeping with his visionary spirit and zest for life, it seems fitting that the variegated buttercup pennywort ‘Crystal Ball’ be named in his honor. After all the Hydrocotyle genus (pennyworts) was one of his favorites. “Greg would be delighted,” - Sue Speichert. ‘Crystal Ball’ “looks” best as an accent plant sweeping down a waterfall or cascading over the edge of a planted container. 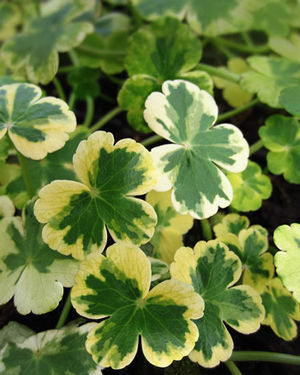 Excellent for lighting up a dark corner of the water garden as it is shade tolerant. Perfect for softening the edges inter-planted among a taller plant such as Taro, Thalia, or Papyrus. ‘Crystal Ball’ “works” best as a biological filter in a watercourse to remove suspended particulate matter. ‘Crystal Ball’ is a good looking workhorse that should be around for years to come in the water garden market.